A breakthrough in the study of chemical reactions during etching and coating of materials was achieved by a research group headed by Kiel physicist, Professor Olaf Magnussen. The team from the Christian-Albrechts-Universität zu Kiel (CAU), Germany, in collaboration with staff from the European Synchrotron Radiation Facility (ESRF) in Grenoble, France, have uncovered for the first time just what happens in manufacturing processes, used for the formation of metal contacts thinner than a human hair in modern consumer electronics, such as flat-screen television. The results appear as the cover feature in the current issue (23.3.2011) of the renowned Journal of the American Chemical Society. For their research the scientists used the intense X-ray radiation of the experimental station ID32, one of the ESRF's instruments. The X-ray beam was directed onto a gold surface while it dissolved in diluted hydrochloric acid. Because the reflected X-rays are sensitive to tiny changes in the atomic arrangement at the material's surface, the metal removal during the reaction can be precisely measured. "Such studies were only possible during very slow changes of the material so far", Olaf Magnussen explains. To gain insight into the fast reactions going on in industrially employed processes the speed of the measurements had to be increased more than a hundredfold. Even during very fast etching the removal of the metal proceeded very uniformly. "The material dissolves quasi atomic layer by atomic layer, without formation of deeper holes", Magnussen remarks. In a similar way, the team could follow the attachment of atoms during the chemical coating of materials. Among the diverse industrial applications of chemical etching and coating are high-tech manufacturing processes, for example in the production of electronic devices. These require precisely controlled reactions. In order to optimize such etching and coating processes they are intensely studied worldwide. Until now it was only possible to analyse the finished product. 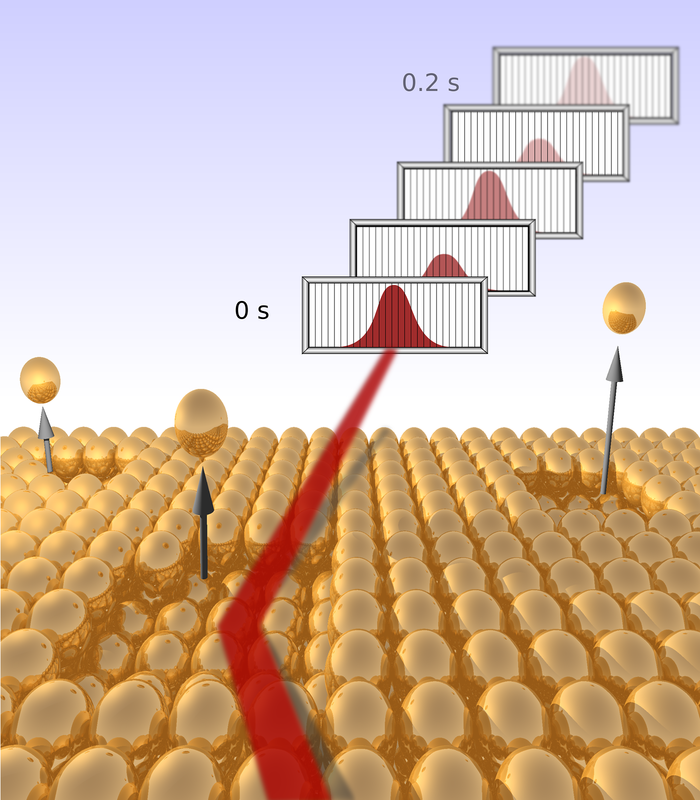 With the method developed by the scientists, changes within a few thousandth seconds may be detected so that the reactions at the material's surface can be tracked on the atomic scale under realistic conditions. Christian-Albrechts-Universität zu Kiel is a North German research university with proven international expertise in the field of nanoscience, including research using synchrotron radiation. In a number of research networks, funded by the German Federal Ministry of Education and Research, Kiel scientists develop new methods and instruments. In addition, the CAU competes for a Cluster of Excellence in the area of nanoscience and surface science within the ongoing round of the German Excellence Initiative. Caption: Graphical representation of the experiment. The X-ray beam impinges on a gold surface, which is chemically dissolving. A fast X-ray detector captures the reflected beam. From the fluctuations of the beam intensity with time, the atomic-scale changes at the surface are deduced. 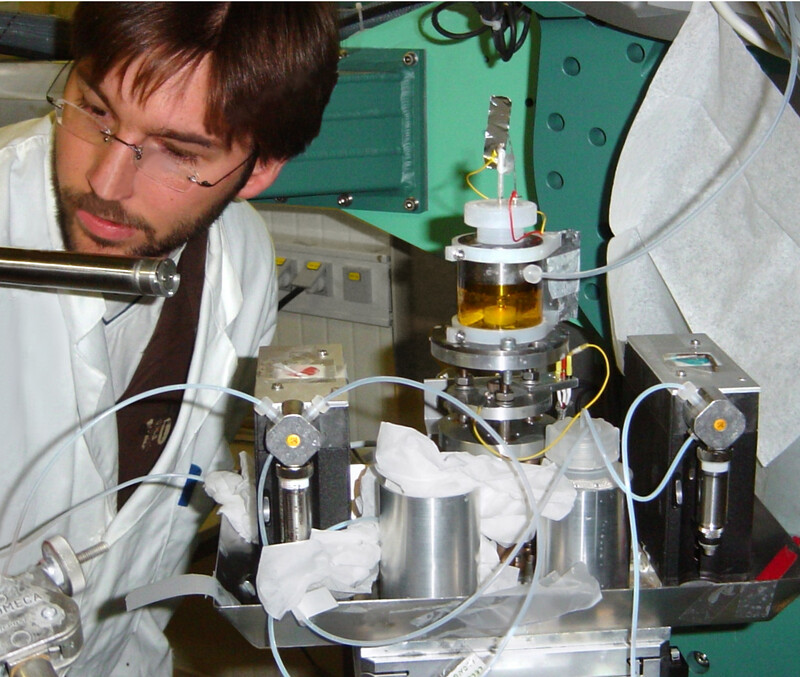 Caption: Graduate student and first author Frederik Golks while adjusting the gold sample for the experiment at the European Synchrotron Radiation Source. Caption: European Synchrotron Radiation Source in Grenoble, France.